Portsmouth News – Wednesday November 18, 2015. Bulgarian by birth, married to a Brit and living at Waterlooville, pianist Valentina Seferinova is a favourite at Portsmouth Music Club – and no wonder. In Austro-German and Russian repertoire, she slipped easily into the different musical languages, even achieving Russian-accented Viennese in Prokofiev’s presentation of Schubert waltzes. That was compelling, and the quirkiness of a Shostakovitch waltz in his Three Fantastic Dances was a delight. In the final sections of Tchaikovsky’s The Seasons, she caught October’s fluidity of movement, tapering down hypnotically; you could hear the rattle of the troika in November; and December’s waltz was rhythmically irresistible. In Scriabin’s Seven Preludes, Op17, she was haunting in stillness as she was stunning at speed. For some listeners (I suspect) a wondrous discovery. We were delighted to welcome Valentina Seferinova back to PMC on 14th November with an Austro-Russian programme beginning with a novelty: a suite of Schubert’s enchanting waltzes arranged by Prokofiev. The persuasiveness of these yielded to the wit of Shostakovitch’s early Fantastic Dances and we were then on to sterner stuff with Brahms’ two sweeping Op 79 Rhapsodies. After the interval, October, November and December from Tchaikovsky’s evocative The Seasons were followed by the highlight of the evening – Scriabin’s Preludes Op 17, and his Two Poèmes Op 32. Throughout the playing had a convincing forward drive and excitement, and some of the most seductive pianissimos I have heard from the Rotunda’s Steinway. Ian Digsby review - Click here. Diana Swann (Portsmouth Music Club Chairperson) review - Click here. 'Valentina Seferinova - Concert Pianist' Facebook post "Great recital at PGS Octogon Room last Saturday week. I have never heard Rachmaninov's C# minor prelude sound so 3-dimensional. It was Lang-Lang stuff!! 'Valentina Seferinova - Concert Pianist' Facebook post "just got back from great couple of days in Portsmouth. Went to an awesome Valentina Seferinova ..piano recital …………………"
" .........for our sold-out Popular Classics pre-season concert on Hayling Island with Colin Jagger, which was thoroughly enjoyed by orchestra and audience alike. An outstanding highlight was Valentina Seferinova’s performance of the Grieg piano concerto, especially the beautiful and moving slow movement." "Overall impressions? There were frequent moments of concentrated silence during the concert, that rarified space where a large group of music lovers focus mentally and spiritually on great art. This testified to the pianist’s outstanding performance ability as well as to the audience’s musical sensibilities. And just as we constantly discover new and old compositions that stand equal in worth to those that fill the popular repertoire but fail to enjoy their prominence, so occasionally we find pianists whose relative obscurity belies their excellence. Both were in evidence last night and I think most of the audience would agree that we were hearing pianism of a high order. As a live performer she definitely ranks, in my opinion, alongside or above some of the most popular international pianists." A very stimulating show of British music, played by an enthusiastic young orchestra and directed with gusto by its founder. Good though it was to hear the Elgar and Vaughan Williams pieces, my focus was on the other three works, pieces which haven’t sent the public light of day in too many years. Dorothy Howell’s Piano Concerto is in one movement, which falls into the usual three sections, and it’s an heroic piece. Starting with a call to arms from the horns, the music unfolds in the grand romantic manner. It could so easily have fallen into sub-Rachmaninovian rhetoric, and occasionally it comes perilously close, but the work it most resembles in sound, from time to time, is the Warsaw Concerto - which wasn’t to be written for another 18 years! What makes it worthwhile is the expert scoring, strong melodic material and brilliant piano writing, plus the fact that it only plays for about 20 minutes and thus doesn’t outstay its welcome and leaves you wanting more. 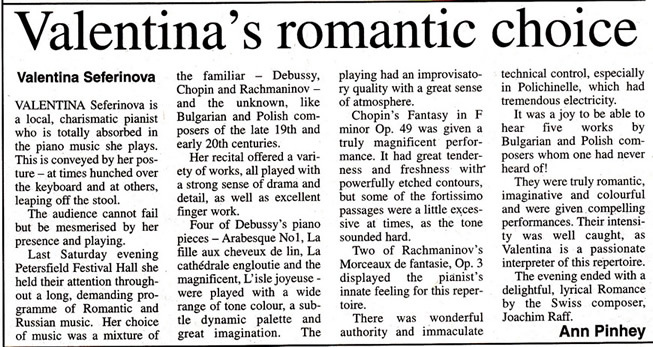 ….. Valentina Seferinova was a most persuasive soloist in Howell’s Concerto ..
"The capacity audience at Chichester Cathedral for Valentina Seferinova's piano recital was held spellbound by the virtuosic range of this slight pale figure with her dark ponytail set off by a flowing royal-blue dress. Far from playing hackneyed lollipops, Valentina chose works by composers such as her fellow Bulgarian Pantcho Vladigerov whose Song op.21 no.3 throbbed with folk melodies, and the Swiss-born romantic composer Joachim Raff sounding like Liszt, and like Liszt demanding the finest technique. This technique Valentina has, as her playing of the Three Pieces, op.2 by Scriabin demonstrated, including the softest pianissimo at the end of the Etude. Rachmaninov's Moments musicaux, op.16, nos. 3 and 4 were the dramatic yet controlled perfect finale. Alan Thurlow who introduced Valentina mentioned that two weeks ago she had played at the AGM of the Rachmaninov Society in London. Present were two of Rachmaninov's great-grandchildren, and at the end they rose to their feet in a standing ovation." 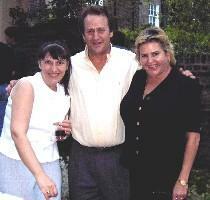 In the presence of Natalie Wanamaker-Javier and Peter Wanamaker - both Great Grand-Children of Sergei Rachmaninov. To a person - a standing ovation. Valentina with Peter and Natalie after the recital with Natalie commenting "You played beautifully". Might not sound much - but when you consider who they are, how many performances of their Great grandfather's work's they've ever heard, and the fact that both were on their feet - then Valentina was able to take it as a high compliment. "I write to say a very big 'thank-you' for visiting Winchester the other Tuesday and presenting such an outstandingly virtuoso performance. The appreciation expressed by members of the audience afterwards was considerable." "Bognor Regis, that quintessentially provincial English seaside resort is unfairly famous for being the subject of the dying George V's last words - quite what he said doesn't bear repetition on a family-friendly website! A more positive claim to fame is to be home of the delightfully intimate Recital Hall where Valentina Seferinova treated a very appreciative audience to a recital featuring some of Raff's finest piano music. One of a series being given by the Bulgarian-born pianist in English south coast venues, this concert was unique in offering an all-Raff programme. The programme in fact mirrored her recently issued CD comprising the compact and innovative Fantasie-Sonate op.168, the meltingly lyrical Trois Morceaux op.2 and finally the majestic second version of the Piano Sonata op.14 from Raff's final years. Rather than offer the usual blow-by-blow account, it suffices to say that her performances displayed all the very considerable merits she already shows on the recording - stunning accuracy, a real feel for the architecture of each piece and an understanding of the contrasting elements of Raff's style, integrating the warmly lyrical with the contrapuntal and fugal. Where the CD hardly does her justice is in conveying her passion and commitment to the music - and this is no criticism of the recording because how could it? She began the recital by explaining to the audience how she had "fallen in love" with Raff's music. This sincere belief in the value of the pieces she was playing was evident from the very first bar of the Fantasie-Sonate, which then unfolded into a reading of fire and power, relieved by a delicate central section of great beauty. It stood revealed as the towering work it surely is. The less serious Trois Morceaux more closely paralleled her CD renditions, though the greater dynamic contrast in the opening Elegie gave it even more substance. The central Romance was utterly charming and the cascade of notes in the twinkling Valse sent the audience off to the interval with a grin. The substantial and potentially drier fare of the Piano Sonata was in safe hands as Seferinova gave it her all. Again, a very "big" performance which built upon her recording by adding an emotional intensity expressed by stronger dynamic contrasts, delicate phrasing and, in the case of the second movement, breathtaking speed. She played from memory throughout and coped with a very noisy piano pedal with aplomb. The audience's appreciation of both Valentina Seferinova and, judging by their comments, Raff himself was fulsome and well merited. She seems a pianist of rare talents - whilst the delicacy might be expected from her small frame, the sheer power is more of a surprise. The quality which came across more than anything else, however, was her total dedication to what she was playing. It is gratifying that Raff has found such a committed interpreter and one looks forward to hearing more of his music from her. Having taken the risky decision to relocate to the UK from Bulgaria, it is to be hoped that she can re-establish for herself the fine reputation which she apparently enjoyed in her homeland. On this showing she is a fine artist indeed and richly deserves success in the wider repertoire on the national and international stage." Drawing Room, on Sunday November 25th. AN EXCELLENT Bulgarian duo, Devorina Gamalova, violin, and Valentina Seferinova, piano, who played in Westridge Drawing Room on Sunday deserved a bigger audience. Miss Gamalova chose a contrasted and demanding pair of works for unaccompanied violin; J. S. Bach's 'Sonata No. 1 in G minor' and Paganini's 'Caprices Nos. 14 and 19'. The other two works where the violin was joined by the piano went beautifully. The 'Sonata' by Prokofiev must have been far above Stalin's comprehension and his demands for socialist realism. It is a lovely work, often ethereal, dreamy and sparse in texture; and the title of the last movement 'Allegrissimo' is one I have not met before. It exactly expresses the speed between allegro and presto which he required. The 'Fantasie in C' by Schubert, though rather long, as often the case with Schubert's instrumental work, gave to the players the chance to give a really musical performance of equals. I understand that Miss Seferinova was one of the leading pianists in her native Bulgaria ............... She has an impressively fluent technique. Their loss is our gain. Members and Friends of the Gosport and Fareham Music Society were given a rare treat with a stunning recital by Bulgarian-born pianist Valentina Seferinova. The somewhat intimate nature of Fareham's Ashcroft art centre seemed, at times, barely large enough to contain the emotion created by the energetic playing of Miss Seferinova. The first half of the programme consisted of a marathon performance of Franz Schubert's Sonata in B flat major which kept the near sell-out audience on the edges of their seats. Following the interval, the programme comprised two interestingly diverse pieces by Scriabin in which the soloist highlighted the melodic aspects of the composers writing. But it was in Debussy's 'Suite Bergamasque' that Miss Seferinova's defined characterisation was a revelation, especially in the well-known 'Clair de Lune' - for once heard in context - whose haunting beauty was captured with stunning accuracy. Little surprise, then, to learn that our guest had been amongst a number of musicians invited to play at the annual Debussy festival in France. For her encore, Miss Seferinova played a piece by one of her countrymen, a mixture of lilting folk-like tunes and warm sounds reminiscent of Rachmaninov.